Egypt’s Coptic Orthodox Church and the Muslim group Al-Azhar have come to an agreement on a unified law for building houses of worship, according to the Cairo daily newspaper al-Masry al-Youm. Egypt has long had strict rules prohibiting the repair or construction of Christian churches — requiring a presidential edict before any work can be done. Such edicts have historically been almost impossible to get. As a result, Christians have built and repaired churches without permits — prompting Muslim extremists to destroy a number of church buildings which they said were illegal. 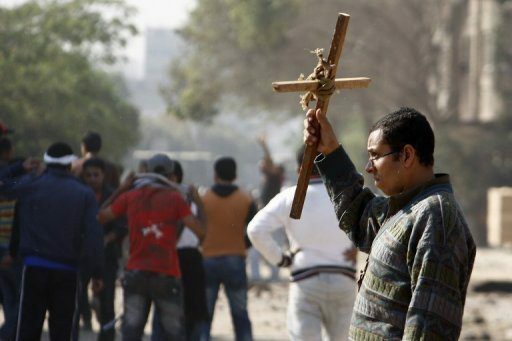 Some of the bloodiest clashes between Egypt’s Christians and Muslims have followed. The Cairo newspaper reported that National Justice Committee member Amir Ramzy said Al-Azhar Grand Sheikh Ahmed al-Tayyeb “gave his consent after demanding some amendments to the law as proposed by Prime Minister Essam Sharaf’s cabinet. Ramzy added that the cabinet has agreed to the amendments and promised to add them to the new law. That was rejected by Christian leaders as too restrictive. Under the new agreement, the square footage requirement has been removed. “This draft is thought to address most of the contentious issues in previous proposals.” reported al-Masry al-Youm. Twenty-four people died in the latest clashes over the church restrictions when the Army opened fire on a Christian protest on October 9.